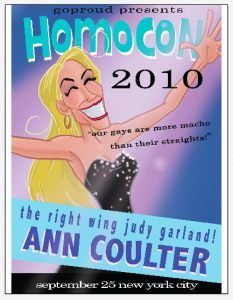 Ann Coulter to Speak at Gay Conservative Gathering HOMOCON 2010 | Virginia Right! Won’t this just bash the left’s stereotype that Republicans are Gay Haters. Conservative Ann Coulter will speak at the New York City HOMOCON 2010 gathering for Conservative Gays. While there are differences of opinion between straight and gay Conservatives, the fact is most understand that it is not our differences that matter as much as our similarities. The GOP is truly a big tent. And no, we are not all the same. Thank goodness for that! If we were all a bunch of mindless robots that all act the same and believe the same we would be, well, Democrats. When it comes down to it, the tie that binds is an urge for smaller government and a fiscally responsible one that lets us make our own decisions. Please click the picture or visit GoProud to purchase tickets for the Saturday, September 25 event being held in New York City!